Sierra is a full-time copywriter for a small Vermont agency who gets her thrills out of big books and double IPAS. She can be found on Twitter @dierrasickey. Paperback or Hardback? Both in tall piles. Brattleboro Books. A used bookstore crammed floor-to-ceiling with one part mystery-thriller paperbacks and two parts pristine special editions. Last treasure I found there? A paperback collection of lists and other enumerations from the Smithsonian Archives. Everyone’s Books. Indie publisher’s bliss. The wall above the cash register is covered in progressive bumper stickers from across the ages. Their “politics” and “environment” shelves always impress me. Books by local publishers like Green Writers Press get displayed front and center on the middle tables. Mystery on Main St. A must-stop if you like Edward Gorey or loved “The House on the Hill.” Games and oddities also sold but the focus is modern and vintage mystery novels. Brooks Memorial Library. Just the one that guards the beginning of downtown proper like a big brick Clifford. There's no limit on books you can check out, and you'll find reams of all the best current periodicals. The bulletin board in the lobby is also where I learn of some of the most interesting things. First Friday Gallery Walks. Every first Friday of the month the town is taken over by gallery-hoppers. Readings occasionally included. Artists Talks @ the BMAC. Every few months when the exhibitions change, the Museum will bring in the creator and curators for a tour and intimate discussion. Next Stage Arts. Find everything else at Next Stage Arts in Putney (music, readings, old films and more). Kipling’s Pub on Elliot St. Kipling did live and write in Brattleboro but who knows if he actually frequented the pub or not. Madame Sherri State Forest. Madame Sherri was not a writer but a woman worthy of many novels. The remains of her jazz age mansion can be found whilst hiking here. Saul Bellow’s Grave Stone. Find this in the Shir Heharim cemetery. Mocha Joe’s. The local coffee roaster’s downtown café has fresh pours and specialty lattes, plus a different baked good delivered from a home kitchen every morning around 8:00 AM. Amy’s Bakery Arts Café. A basic coffee and espresso bar sits behind the charming bakery cases. All the cookies are under $3.00 and delectable. Lunches here are also hearty and heart-warming. Ice cream in the summer. Superfresh Café. Vegan delights! Fill up on a magnificent grain and greens bowl or try something new with one of their hot elixirs. A downtown lunchtime staple with seating overlooking a mini-waterfall. The Co-op Café. Affordable and crowd-pleasing, with hot and cold deli items cooked up everyday. Duo Restaurant. Top notch atmosphere, cocktails, apps, and entrees without being too top-shelf. Farm to table finery in a down to earth atmosphere. I would end everyday here with a book by the bar if I could. The Works. The only place to get a bagel on Main St. Incredibly cheap lunch specials and uber-friendly counter staff. Three Stones Mayan. If you don’t know what you’re looking for you’ll drive right past it. Looks like a hole in the wall but locals and others know and love it too well for it to truly qualify as such. Fresh tortillas every night they’re open (which is not often). 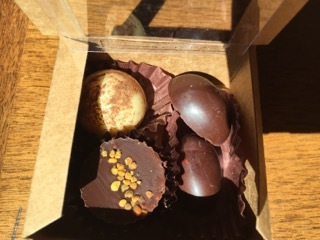 Tavernier Chocolates. While their Dwell-worthy factory in the Cotton Mill is absolutely worth a visit, they can also be found at the Saturday Farmer’s Markets with plenty of samples and good conversation to go along with their gourmet chocolate and confections. The Concession stand at The Latchis Theatre. Only open prior to show times, but the 1938 Art Deco building is delicious in itself. 5. Favorite thing about Brattleboro: “Scrappy” is a positive adjective.